Our doctors recommend that a child should have their first dental appointment within 6 months of their first tooth erupting or by their first birthday. And, during their first visit, we’ll spend most of the appointment just getting them acclimated to the office. At our practice, we understand children need a gentle touch, so we know it’s best to start slow. Once they are comfortable, we can offer a variety of services specifically geared towards helping your little smile stay healthy while it grows and develops. To learn about everything we can do to keep your most precious smile strong, simply read on below. Even before your child has teeth, taking care of their mouth is very important. After every feeding, you should gently clean their gums with a washcloth moistened with warm water. After their first tooth shows up, it’s time to bust out the brush! Use a small, soft-bristled toothbrush with only water until your child knows how to spit. After that, you can then start using a small amount of toothpaste to clean their teeth (making sure it’s children’s toothpaste). When it comes to children, their checkups and cleanings are just as much about education as they are about dental care. 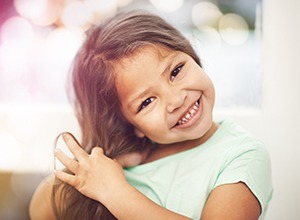 When you bring your child to our office for the first time, you’ll have a chance to discuss their dental health with their doctor before any treatment is performed. Then, they’ll perform an oral exam and gentle cleaning while your child lays in your lap. They’ll count their teeth, look at their gums, and search for many of the same dental problems adults have. These appointments are also when your doctor can talk to your child about why brushing their teeth is important, how to properly do it, and how their diet can affect their smile. Sometimes, hearing this information from an adult that isn’t a parent is all it takes for it to finally stick! 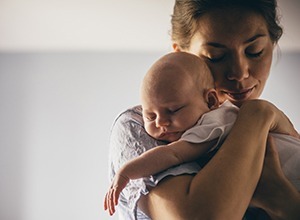 After their first appointment, be sure to bring your child in every 6 months just like yourself. 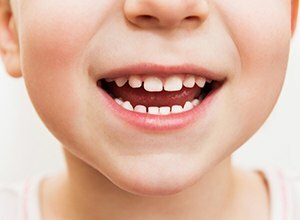 The chewing surfaces of the back teeth are the most common place for children to develop cavities. Why? Because little hands tend to have difficulty reaching them while they are still learning to brush. To give your child a little extra protection right where they need it, we can apply a thin, clear layer of a plastic-based substance called a dental sealant. This will create a barrier on the tooth which food particles and bacteria can’t penetrate, effectively preventing both tooth decay and cavities for these vulnerable teeth. Fluoride is a natural mineral that actually helps strengthen the teeth against tooth decay and cavities. For this treatment, your child will wear a comfortable set of mouth trays that are filled with a highly-concentrated fluoride gel. After 1-4 minutes, they’ll be removed, and that’s it! This can help keep your child’s smile strong until it is time for their next checkup. 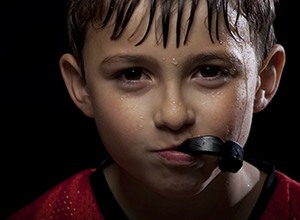 Of course, you want to keep your child safe whenever they go to play sports, but before you put on their helmet, make sure they’re wearing a mouthguard as well! Dental injuries for children during sports are all too common and easily preventable. We can provide your child with a custom-made mouthguard, and it’ll not only protect their smile better than anything you can buy at the store, but it’ll also be more comfortable and allow them to breathe better. A frenulum is a small piece of tissue that helps different parts of your body function properly, and the mouth actually has 3: one on each lip that connects it to the gums and one under the tongue. Sometimes, a short or thick frenulum can restrict the movement of the lips or tongue, which can cause a variety of harmful side effects for children, including speech issues, breathing problems, and difficulty breastfeeding. Fortunately, the procedure to fix this, called a frenectomy, is quick, easy, painless, and your child will feel the benefits almost immediately. If you have any questions about your child’s dental care, we’re always here to help. To get the answers you need, or to schedule an appointment, please contact us today.